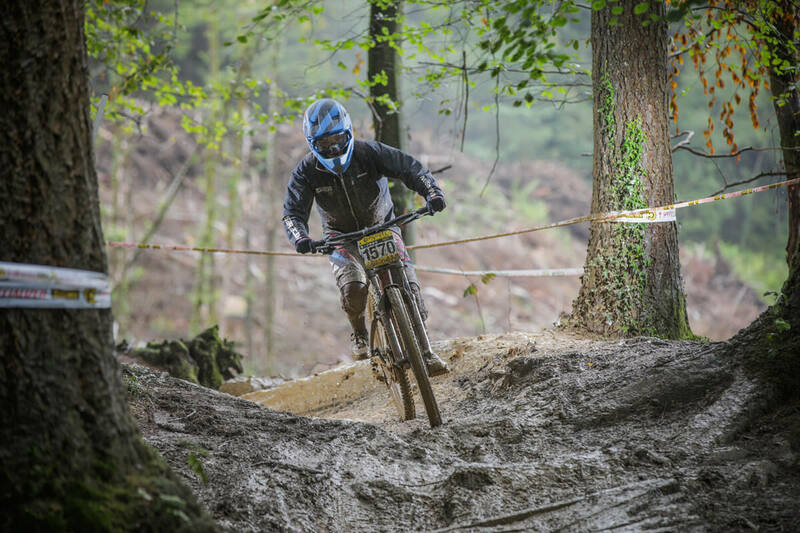 Round 4 of the Pearce Cycles downhill series was held at Rheloa on Sunday 16th July. What started off as a dry track on Friday became a mud bath come race day! Well done to every single person who raced that track this weekend. Here’s Corinna’s race report. After a 3 hour drive down to Rheola on Friday I was ready for a track walk. The track looked amazing – it was a longer track than I am used to but it looked like some insane fun. Every part of the track was pretty much bone dry, looking extremely fast and it seemed to have everything – roots, rocks, drops, jumps only thing that lacked was corners but I wasn’t complaining! Buzzing to get riding it on Saturday! Rain.. rain.. rain.. and even more rain. Rained through the night.. rained all day. The track was a mess. Surprisingly it was still a lot of fun, and even though it was like a stream there was plenty of grip at the top so you could still carry speed through the top and middle sections. The bottom woods however were treacherous, the section that is named ‘star wars’ was a muddy slop galore; still rideable but exceptionally hard to keep feet up! I thought at some points to give up but I had to remember the other parts of the track which I loved riding! Onto race day… Where do I start! It rained through the night again. Sunday practice was like riding a different track to me, not so much the top sections but just those scary woods! I changed my line through some roots so that I could at least stay on my bike and getting through the very bottom woods was a task but I was managing! Time to race; for me it wasn’t about carrying speed it was about getting to the bottom of the track without falling off as I had been falling off continuously that morning and during Saturday’s practice, including some immense over the bars action. I was very nervous and pretty scared as earlier in the day someone had suffered a serious injury from a crash. First race run I felt good in the top section but not surprisingly I came off after losing control. Not sure how but I got through the woods clean but fell off AGAIN at the bottom into the finish arena and as a result winded myself which wasn’t too great! Contemplating not bothering with a second run as I was battered and bruised from the weekend but I knew if I didn’t complete it I would go home on feeling rubbish. With only 2 other girls in my category I knew I would be coming last, my fitness was horrific so pedalling wasn’t an option towards the bottom and my confidence had considerably dropped. Second run came round quick, I was making mistakes where I hadn’t before and had another crash towards the bottom, again where I’d never had an issue with before! I kept a smile on my face and felt proud of myself that I even made it down. I can take a lot of positive away from that weekend although I was hating life at some points haha! I have to remember that everyone was in the same boat as me and that I would feel a sense of achievement by completing the whole weekend. I have never ridden anything in the same league as this track, ever. I have ridden tracks in the wet but not that wet and with so many drops involved. I finished off the weekend with a podium! Then came round the journey home with many bin bags of mud plastered kit, a bike that needed some pampering and a very achy, sore body. Very much a weekend to remember.